TenguLife: The curious guide to Japan: Sherlock in Japan; Gulliver next? Sherlock, the Benedict Cumberbatch - Martin Freeman re-interpretation of the classic Arthur Conan Doyle detective stories has proved a massive hit in Japan. So much so that at the moment we're seeing re-runs not only of the nine episodes made to date (come on Sherlock, 2016 is a long way off to wait for the next series!) 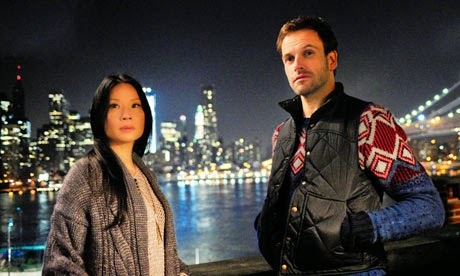 but also Elementary, the Lucy Liu version as Watson with that other chap (apologies, but that's how my friends refer to him) and additionally multiple non-English language versions of a dapper Basil Rathbone-esque deerstalker variety (one of which is something Eastern European but I'm not absolutely sure where from; possibly Hungarian, definitely not Russian). Japan loves a good mystery and all the original stories had been translated by the early 1950's after a thirty year labour of love from the author Nobuhara Ken. He had retreated to the old postal town of Oiwake, a day's walk on the Nakasendo (the ancient road from Kyoto to Tokyo) to the popular resort destination of Karuizawa, itself some three hours train northwest of Tokyo (in the days before the Shinkansen). Nobuhara fell in love with the area and eventually settled in the village, bringing a permanent connection to Sherlock in the process. 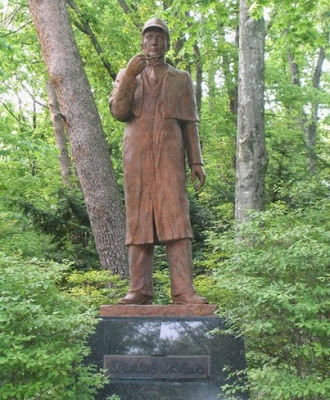 Koshinzuka Park, Oiwake, the only statue in Japan. A classic.